The effects of grazing on the seedling emergence was studied in a conservation reserve containing two enclosures; one with camels at high stocking rates (DDCR), and an enclosure of five years with gazelle and Oryx at lower stocking rates (Al Maha). Post-rainfall seed germination was measured within the two enclosures by counting and identifying all seedlings within 1m² plots. Germination varied enormously from place to place. The gravel substratum contained a very different mix of species than the surrounding dunes. Al Maha plots contained more species than DDCR plot, but the difference was mainly in seedlings of perennial rather than annual species. A greater density of annual species sprouted near established small shrubs, but it is unclear if this is due to local seed dispersal or soil conditions that favored both shrubs and seedlings. No germination was observed to be associated with feces of camels, Oryx, gazelle or spiny-tailed lizards. 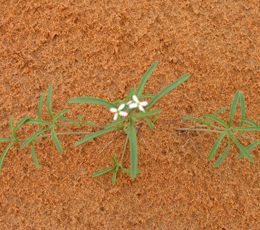 Plants reached reproductive maturity at a height of 10cm or less, reflecting the extreme aridity of the location. The observed differences among enclosures were probably due to a combination of livestock grazing and granivore effects on the seed bank, and microhabitat differences associated with the vegetation.